Healthy Skin – The high zinc content helps produce collagen, giving skin more elasticity and helping repair damaged body tissues. Helps Lessen Anxiety – Sesame seeds contain the stress-relieving minerals magnesium and calcium. Sesame also contains the calming vitamins thiamin and tryptophan that help produce serotonin, which reduces pain, assists moods and helps you sleep deeply. 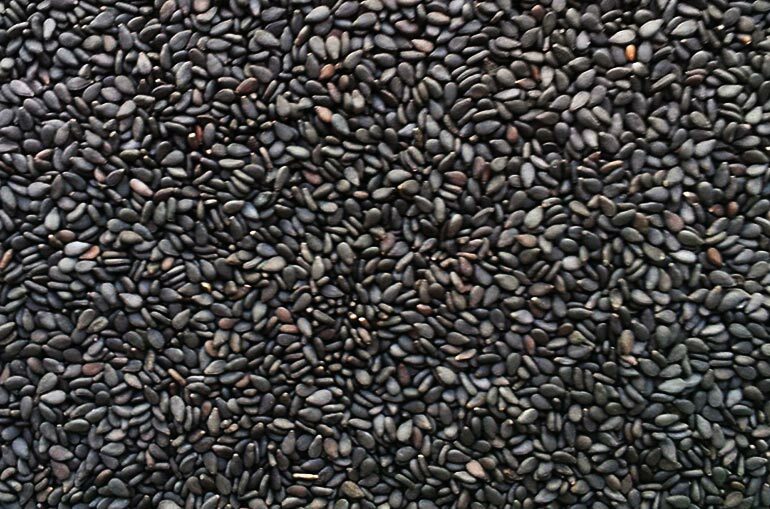 Alleviates Anemia – Black sesame seeds are particularly rich in iron, so they’re highly recommended for vegan, vegetarian and those who are anaemic. Prevents Wrinkles – Sesame seed oil prevents harmful ultraviolet rays of the sun from damaging your skin, thus preventing the appearance of wrinkles and pigmentation. Encourages Bone Health and Prevents Osteoporosis – A handful of sesame seeds contains more calcium than a glass of milk. Also the high zinc content of sesame boosts bone mineral density. Black sesame milk is a recent staple at home I’ve been making, it has become great as a substitute to cow’s milk for smoothies. Making seed milk is much like nut milk, with a whole bunch of left over pulp here is a beautiful dense dark chocolate sesame tea cake to share. Preheat your oven to 175°C. Grease loaf tin with a little oil or line it with baking parchment. Measure and sift the cocoa powder into a bowl and whisk in the boiling water until smooth and well mixed. Whisk in the vanilla extract, then set aside to cool a little. Using a separate bowl, combine the ground sesame, ground almond with bicarbonate of soda and pinch of salt. Place the sugar, olive oil and eggs into the bowl of a freestanding mixer with the paddle attachment to beat together vigorously for about 3 minutes until you have a pale, aerated and thickened cream consitency. Turn the speed down on low and pour in the cocoa mixture, beating as you go once incorporated, add in the sesame and almond mixture. Scrape down to ensure it’s well mixed, pour the liquid batter into the prepared tin. Bake for 40-45 minutes or until cake skew test clean. Once done let it the cake sit cool for 10 minutes on a wire rack in it’s tin. Leave to cool completely before icing it or serve up as is with your favourite cup of tea. What a beautiful cake – it looks fabulously moist! An intriguing set of ingredients as well – it sounds very rich.